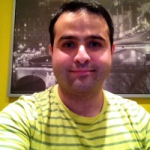 Hossein graduated from Canadian College of Massage & Hydrotherapy in 2010. Hossein has a diploma in Math and Physics and he wanted to become an engineer. However after coming to Canada he realized that his passion is Holistic approach to health care. He was so impressed that he started a program in Holistic Health and acupuncture at Canadian College of Holistic Health from 2006 to 2008. Studying in the college, he was introduced into “Massage Therapy” and as a result he pursues that enthusiastically. Hossein gained experience and improved his skills working with a variety of clients with different conditions and disorders in many clinics and including the Toronto Rehabilitation Center.